The edible Umbra Fruit has countless health benefits. Wonderful to be grown in one’s garden to harvest its bunches of fruits that are available all year long. In Malaysia, its fruit is one of the favourite ingredients that’s mixed with shrimp paste in rojak. Botanical Name: Spondias dulcis (syn. : Spondias cytherea). 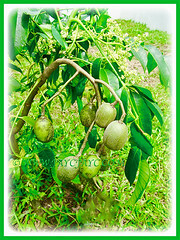 Common Names: Ambarella, Golden Apple, Yellow/Golden Plum, Jewish/Polynesian Plum, Umbra Fruit, Buah Kedondong in Malay. Etymology: The specific epithet dulcis is from the Latin word dulcis meaning sweet, referring to its refreshing sweet juice. Origin: Native to Malesia, Polynesia and Indo-china. It is also cultivated worldwide. Features: Spondias dulcis is from the genus, Spondias that consists of about 17 species of flowering plants. This fast-growing, deciduous or semi-evergreen tree can reach up to 9-12 m tall in ground under cultivation. As a potted plant, it usually reaches 2-3 metres in height. 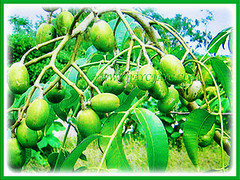 Spondias dulcis has deciduous, pinnate leaves, 20–60 cm long, composed of 9 to 25 glossy, elliptic or obovate-oblong leaflets 9–10 cm long and have finely toothed margins. The leaves are arranged opposite one another along the stem. The bark that is light grey-brown and smooth has been used to manufacture canoes on the Society Islands. The tree produces bisexual, small, inconspicuous white and five-petaled flowers in terminal panicles, and appear all year round. 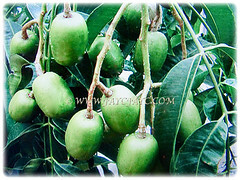 Its oval fruits, up to 10 cm long, are borne in bunches of 12 or more on a long stalk. The edible drupes with a single seed and contain lots of fibre are first green and ripen to golden-yellow. Fruiting branches droop under the weight and may even break. 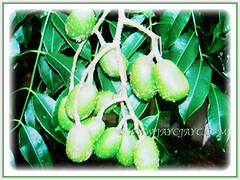 Occasionally they fall of the tree while still green and then continue to ripen. 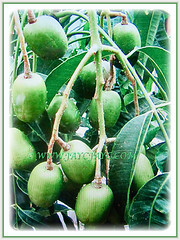 Culture (Care): Spondias dulcis or Golden Plum can be easily grown with least maintenance. Others: Water freely during growth and apply a liquid balanced fertilizer every two weeks. Generally free from serious pest and diseases. Nevertheless, do watch out for red spider mites, larvae of Kedongdong spring-beetle. 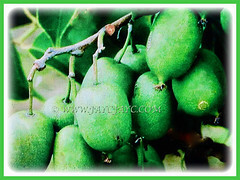 Spondias dulcis or Polynesian Plum can withstand temperatures only above 1.2ºC and prefers a sunny site. Young specimens should have a little shade. Since the branches get brittle with age the trees should be protected from strong winds. Outside of the tropics, Spondias dulcis can be kept in a conservatory or as a potted plant that may be placed outside in summer. In winter keep the plants in a bright place at around 10°C while keeping the soil just moist. Propagation: Easily propagated by sowing the seeds that will germinate within 4 weeks of being sowed. Alternatively, it can be propagated by hardwood stem cuttings, grafting or air-layering. Usage: Spondias dulcis or Ambarella are ideal for container planting. They are most commonly used as a food source. 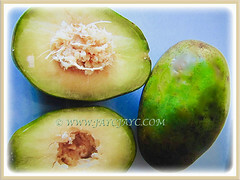 The ripe fruits can be eaten raw, cooked or made into a refreshing drink. The flesh is crunchy and has sweet sourish flavour. It is eaten with shrimp paste in rojak in Malaysia. 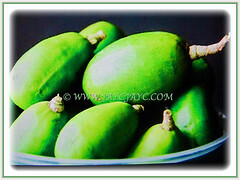 The unripe fruits are made into jellies, pickles or used to flavour soups and stews. 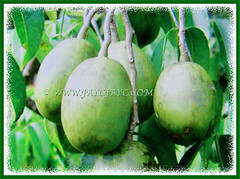 It is one of the richest known source of vitamin C and used for treating throat and respiratory tract infections. 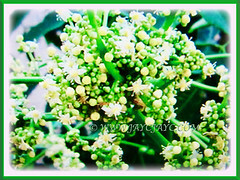 Traditionally it is used to treat indigestion, fever, liver problems and anaemia.